General Congreve had confidence in the ability of his two attacking Divisions to capture their objectives, but, lacked the same confidence in them holding on to their gains. A swift and thorough consolidation was necessary to ensure a stout defence against expected German counter attacks; these had to be defeated. A detailed consolidation and defensive scheme was developed during the planning phase and practiced at the Corps training area. The strategy had many facets including the role of attacking infantry battalions and their initial consolidation. Units would hold an outer perimeter and construct in-depth Strong-Points. Three of 30th Divisions infantry battalions were detailed as carriers; their only task being to transport all the materials required for defensive construction and replenishment of ammunition. The artillery would also play their part in the consolidation phase. Prior to the accomplishment of the bombardment supporting the infantry attack, several field artillery batteries switched from an ‘offensive’ to a ‘defensive’ fire plan. To achieve an artillery defence during consolidation that could engage German counter attacks within the effective range of the field guns, several forward batteries had remained hidden during the week’s preliminary bombardment whilst others were earmarked for an immediate move to advance positions between Maricourt and Montauban. Royal Engineer Field Companies and Divisional pioneers, the 11th South Lancashire Regiment, were tasked with constructing Strong-Points and repairing the Maricourt - Montauban Road in order to move the field artillery forward at the earliest opportunity. Concise planning and preparations coupled with a rapid construction of defences would pay dividends. 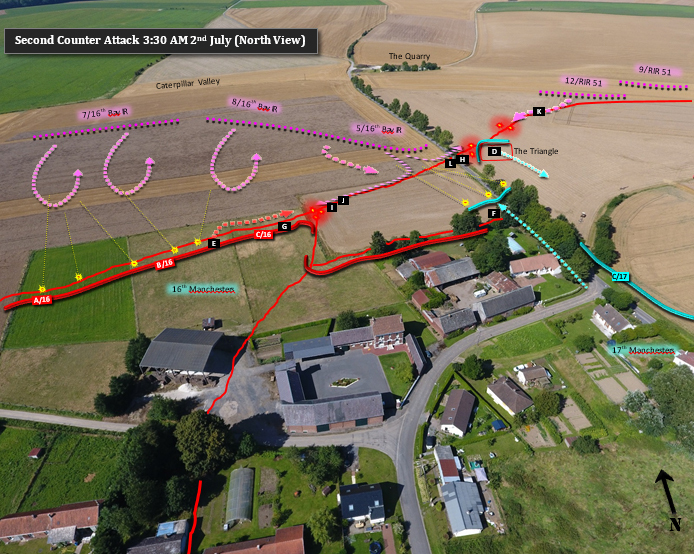 During the 60-hour period, post Zero Hour, two separate German counter attacks would be launched against the new line. 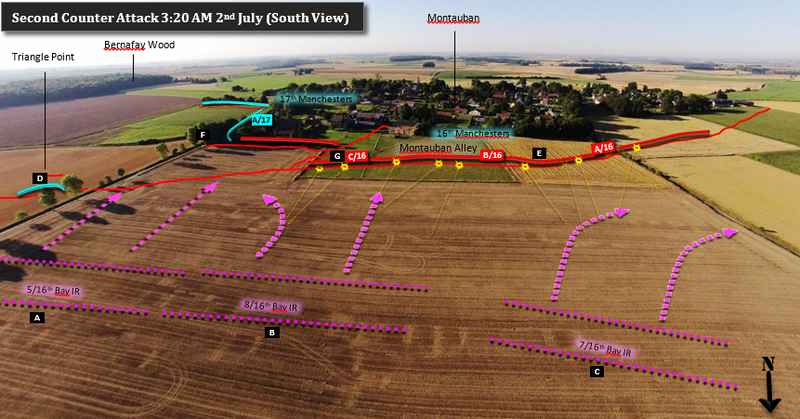 The threat of a German counter attack existed from the moment 90th Brigade entered Montauban. It was possible for German infantry to mass either in Caterpillar Valley or Bernafay Wood unobserved by XIII Corps ground FOOs and infantry. Only aerial observation via No.9 Squadron RFC could observe the valley bottom and the northern and eastern approaches to the wood. To counter the threat, the consolidation and defensive scheme called for 30th Division’s field artillery to be able to engage German infantry at distant ranges; as far as the ridge linking Longueval and Bazentin-le-Grand, including the German main second line, Caterpillar Valley and exits from Bernafay Wood. It was essential the artillery screen was effective by 10 am on the morning of Z Day, the time at which orders dictated 90th Brigade would attack Montauban. The field artillery designated as ‘forward’ batteries began their bombardment at 6.25 am in support of the initial advance. Once their opening tasks were complete they switched to defensive fire. In total, five 18-pounder and two 4.5-inch batteries were available from their current emplacements north of the Peronne Road, either in front of Oxford Copse or along the southern confines of Maricourt. These 18-pounder guns could engage targets at their maximum effective range 6,525-yards against the previously mentioned Longueval – Bazentin Ridge, the enemy second line, and just beyond. To support the seven batteries, three more were ordered to advance to previously reconnoitred forward positions at 8.30 am. 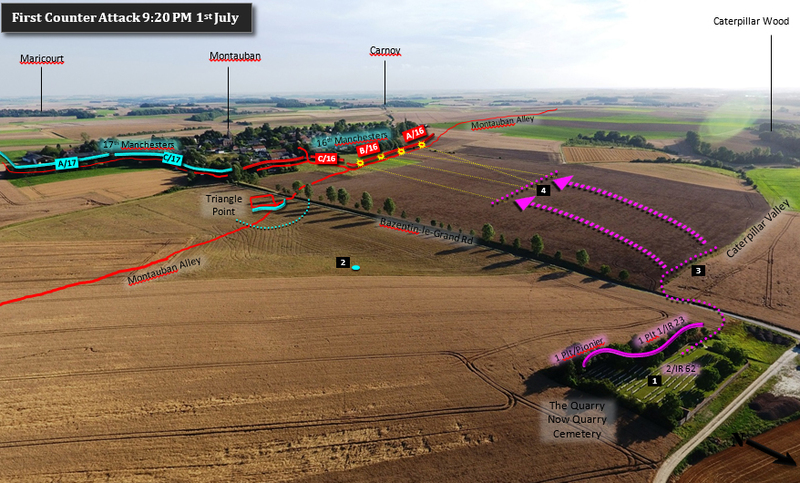 By midday the Infantry Brigades of 30th Division had established a defensive perimeter garrisoned by the attack battalions of 90th and 89th Brigades. In-depth, the construction of a series of mutually supporting Strong-Points or Keeps was well underway. The topography of Caterpillar Valley allowed an attacking force to gather in dead ground in the valley bottom unobserved from the main outer perimeter line. To reduce the dead ground available to the Germans and to offer a better field of fire and early warning to the main British perimeter, an advance post was established close to Triangle Point. To provide ‘depth’ to the defence ‘Keeps’ were constructed within the confines and perimeter of Montauban whilst ‘Strong-Points’ were created further in-depth inside the former German trench system. The plan was to create 360˚ defensive positions; six Keeps and thirteen Strong-Points connected with repaired German or newly dug trenches. Each of the three Brigades was responsible for an ‘area’ of defence. 90th Brigade took the six Keeps in Montauban, 89th Brigade six Strong-Points, four to be dug immediately followed by a further two and 21st Brigade had seven Strong-Points, four immediate and three later. Each Brigade formed its own strong-point construction party comprised of one section from their Brigade Royal Engineers Field Company, 32 men, a platoon of Pioneers, 40 men and two infantry platoons of 80 men. 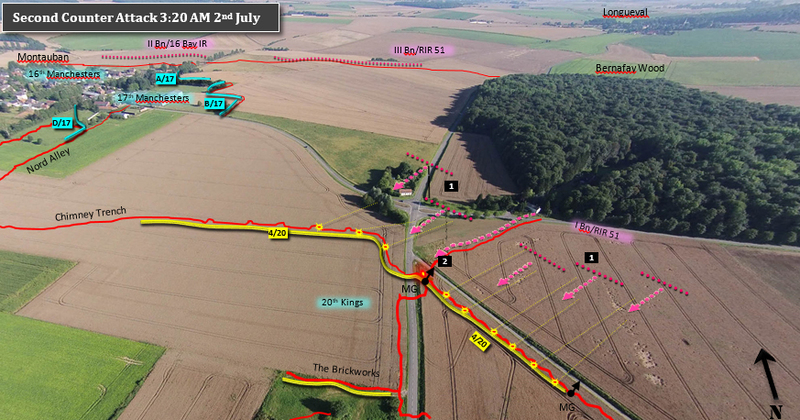 By mid-afternoon 1 July German forces opposing 30th Division were in a state of disarray. 6th Bav RIR barely existed, having suffered in the region of 3,000 causalities out of a regimental strength of 3,500 all ranks. IR 62 had fared slightly better, having been in support to the Bavarians. In front of Montauban and the Brickworks the German 12th Infantry Division (12th ID) had very few troops in which to stop any further advance by the British. At 4 pm (German time) No.8 Kompanie IR 62 and a pioneer platoon moved forward from their reserve position at Longueval to Bernafay Wood. They pushed through the undergrowth to the western and southern edges. Shortly after, they were joined by No.4 Kompanie IR 62. The other surviving ‘under strength’ kompanies were sent via Hardecourt to Bois Faviere where fighting still raged with the French. 12th ID had no reserves except for four inexperienced recruit kompanies. In Caterpillar Valley only the previously mentioned German Quarry garrison existed; it was comprised of No.2 Kompanie IR 62 commanded by Oberleutnant der Reserve Troch, a platoon from No.1 Kompanie IR 23 under Leutnant der Reserve Chrzaszcz, a pionier platoon and several survivors of the morning’s fighting from No.1 and No.7 Kompanies IR 62 and 6 Bav RIR. All in, this force was only approximately 150 men, many of which were walking wounded. At that time they were the only German troops apart from several artillery batteries between 30th Division and open country beyond. At some point, close to 9 pm, a small party of between 30-50 men, probably Silesians from No.2 Kompanie IR 62, under the command of Oberleutnant der Reserve Gustav Troch, crept out of their hiding place in the Quarry and stealthily pushed west through the tall grass along the valley bottom. At a point approximately 100-yards west of the Bazentin-le-Grand Road they turned south and advanced in extended order. The German counter barrage still falling on Montauban offered some cover. For the first 300-yards, as they advanced up the slope towards Montauban Alley, they remained unseen in the dead ground. But as their heads and upper torsos broke the sky-line, alert Manchester Pals sentries observed the approaching enemy. Along the perimeter, sentries, as loud as their lungs would allow them, shouted ‘Stand To.’ The order was repeated over and over as men dashed to their allotted newly dug fire steps. At a range of less than 300-yards no fire orders appear to have been given. Initially, an occasional shot rang out as the sentries ‘loosed off’ their first shots. Within seconds Lewis-guns opened automatic fire followed by a crescendo of rapid fire against the thin line of brave German soldiers. 1By the early afternoon a mix of German units takes refuge in the quarry they include: 2nd Komp IR 62, 1 Plt of 1st Komp IR 23, one Pionier Plt and stragglers from IR 62 and 6 Bav RIR. They are engaged by a No9 Sqn RFC Lewis gun but otherwise remained hidden except for occasional sniping. 2While conducting a reconnaissance the Brigade Wiring Officer, 2nd Lieut Victor Godfrey is mortally wounded by a sniper. Rescue attempts are unsuccessful. 3 During the evening Oberleutnant Troch is believed to have led 2nd Komp IR 62 from the Quarry on a route through the dead ground to a position adjacent Montauban Alley. They turn north and advance up the slope. 4 As the Silesians emerge over the slope sentries and advance posts call the ‘Stand To’ and engage the advancing Germans. Within a short space of time the counter attack withdrawals leaving many casualties. German High Command had not lost its nerve or been idle; they had, by now, collated numerous situation reports from their various sectors and assessed the situation along the entire Somme front. Their attention now turned to areas of allied breakthrough. Reserve units were rushed to these areas. The 10th Bavarian Infantry Division (10th Bav ID) arrived from the Arras sector where it had been in action since 13 May. Comprising three regiments, it was divided up with the 16th Bavarian Reserve Infantry Regiment (16th Bav RIR) being temporarily transferred to the 28th Reserve Division (28th Res ID), which had the responsibility of the Bazentin – Longueval sector. Later, further re-enforcements arrived. Reserve Infantry Regiment 51 (RIR 51) of the Silesian 12th Reserve Infantry Division (12th Res ID) entrained at Neuville les Cambrai early on 1 July and then marched all night to an assembly position in Trônes Wood, relieving the mixed troops of IR 62 and the recruit kompanies. Plans were immediately undertaken to drive the British from Montauban. 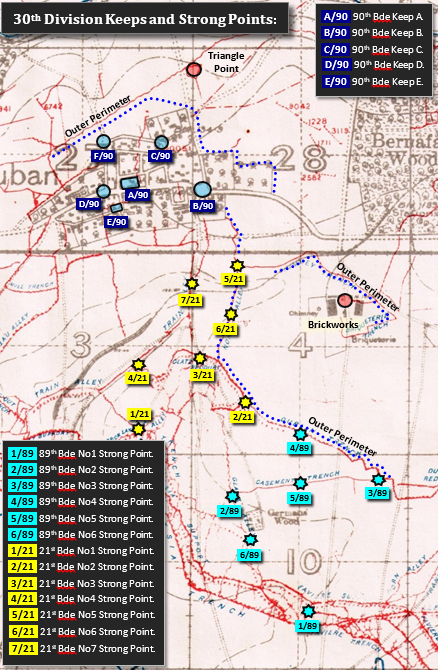 We know the German counter-attack strategy was a simple plan with a limited objective because a copy of the ‘one-page attack order’ was captured after the action.14 The document showed the counter-attack would comprise four and a half assault battalions and one reserve battalion; I and II Bns, 16th Bav RIR on the right (west) opposite Montauban Ridge and village and III and I Bns with a further two kompanies of II Bn, RIR 51, from the south and through Bernafay Wood. The boundary between the two Regiments was the Montauban - Bazentin-le-Grand Road. The II Bn, 16th Bav IR, taking the main brunt of the attack, would assault with the aforementioned road on its left to a point 600 metres west in line with the western limits of Montauban. On their left III Bn, RIR 51 would attack from the northern edge of Bernafay Wood in a north-westerly direction towards the eastern limits of Montauban taking on the east of the village. I Bn, 16th Bav IR would assault on the right flank from Caterpillar Wood and III Bn, 16th Bav IR would hold the main German second line along Longueval Ridge. Scharf Schützen Trupps 87 and 44 (Sharpshooter Machine-gun Troops) were designated as support to the Bavarians. I Bn and two kompanies of II Bn, RIR 51 would assault through Bernafay Wood on the left flank. Artillery support for the whole operation would come from 28th Reserve Field Artillery Brigade with a continuous bombardment of Montauban and west along the ridge. Planning and briefing for the operation was somewhat rushed due to the urgency and stipulations imposed by German High Command and the late arrival of units taking part. It was imperative the attack was conducted during the hours of darkness due to the nature of the ground. Daylight would compromise the Germans’ passage across the valley except in the limited areas of dead ground or within the confines of woods. Once British aircraft were aloft, at first light, any movement within the valley would soon be engaged by the superior British artillery. The attack must also be conducted simultaneously by all the attacking units; again this would require liaison and links on flanks. The German units advanced separately to their attack start-lines. II Bn, 16th Bav IR in the centre, would control the attack with its commander Major Otto Killermann as the overall attack commander. As Bavarians topped the slope the extended mass of men made a perfect target, the Manchester garrison took careful aim and opened rapid fire with deadly accuracy. Riflemen picked off individual Germans while Lewis and Vickers guns fired long bursts into the massed ranks. The bullets zipped past and smashed into the Bavarians who advanced into the inferno of fire. ALeut der Res. Karl Weber, OC 5 Kompanie, 16th Bav IR. BLeut. Albert Schwub, OC 8 Kompanie, 16th Bav IR. CLeut. Baptist Scheuring, OC 7 Kompanie, 16th Bav IR. DPte Allan Bell, 17th Manchester, Triangle Point. ELieut. Anthony T Nash, 16th Manchesters. FCapt. John Greville Madden, 17th Manchesters. GCapt. William Morton Johnson, 16th Manchesters. HLeut der Res. Ludwig Thurnreiter, 5 Komp, 16th Bav IR. IVizefeldwebel Mar Zipperer, 8 Komp, 16th Bav IR. JLeut der Res. Hans Drechsler, 8 Komp, 16th Bav IR. KLeut. der Res. Reichmann, 12 Komp, RIR 51. LUnteroffizier Johann Bauer, 5 Komp, 16th Bav IR. On the 16th Manchesters’ right, Capt. Morton-Johnson and the remnants of C Company, were in the thick of it, as were the small garrison at Triangle Point. The Bavarians of No.’s 5 and 8 Kompanies had succeeded in closing the net on the dwindling garrison, penetrating into an unmanned section of Montauban Alley. The German soldiers, now in the relative safety of the trench, worked east and west. As they closed in on the Manchesters, entering the west of the position, grenades ran short until a supply of British Mills were discovered and utilised. The Bavarians now turned their attention to the east and proceeded to bomb along Montauban Alley towards C Company, 16th Manchesters. It was here that the fight developed. Contrary to the account provided by 90th Brigade, the Bavarians claim to have held onto the position for hours, well into the afternoon, utilising the captured digging tools and sandbags to re-enforce their gain. It was when their own artillery commenced shelling their location, resulting in the death of several men, they realised the situation was unwinnable and withdrew down the slope to the Quarry. Their decision was further augmented by heavy British shelling, scarcity of ammunition and mounting casualties; No.5 Kompanie suffered 16 killed, No.8 Kompanie had 22 killed. At the other gun early in the morning Pte’s Regan and Bland were on duty by the gun, the remainder of the team being some distance away and working on alternative emplacements meanwhile five or six Germans managed to get down the communication trench running from Bernafay Wood to our position and one of them threw a grenade which killed Pte Bland before the gun could be mounted. Pte. Regan immediately attacked the party with a revolver and drove them out of the trench, finally dispersing them. Pte. John Regan was decorated with the DCM for rescuing the gun. The other Vickers team and the 20th King’s repelled the German attack with ease. Twenty-three-year-old Pte. John Bland is commemorated on the Thiepval Memorial. The German counter attack was over. Against the odds, despite being exhausted and low on ammunition the so called amateur soldiers of the Manchester and Liverpool Pals had triumphed. Not only had they captured their objectives in full, as per the Corps timetable, they had managed to hold on to their hard won gains. Gen. Congreve VC need not have worried. The Bavarian and Silesian troops dragging their wounded, withdrew back over the slope into the dead ground and the confines of the wood, only to be caught in a wall of fire created by the British defensive artillery barrage. In total, 16th Bav RIR lost 72 men killed and 256 wounded in their unsuccessful effort to re-capture Montauban.32 The losses of RIR 51 are unknown. 1Approximately 100 German infantry of RIR 51 attack No4 Company, 20th Kings in section rushes from Bernafay Wood. Almost everywhere the Germans are 2A section of German bombers works down the communication trench to a block. The Silesians throw a grenade at two man Vickers team killing Pte. Bland. The survivor Pte. Regan attacks the enemy with his revolver driving the Germans back along the trench.